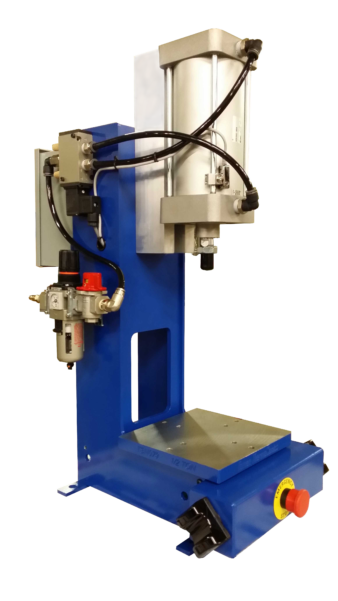 This versatile, all steel constructed, 1/2 ton air press (tonnage based on 80 psi) can be used in punching, crimping or forming your product assembly. It can be easily tooled or retooled using inexpensive, standard die sets. The press features standard no-touch buttons which are superior to mechanical push buttons. Just the presence of your fingers on these photoelectric buttons interrupts the infrared sensing beam to activate the switch. This eliminates hand, wrist and arm stress associated with repeated, mechanical switch operation which greatly reduces the risk of Carpal Tunnel Syndrome. Press activation is the same on all of our air presses, when the operator touches the two palm buttons, the press ram advances as long as their fingers remain in place. If they remove their fingers the ram immediately retracts. If you order your machine with the timer option, the operator can remove their hands from the palm buttons once the press ram is past the pinch point. The timer can be set from 0 to 5 seconds.